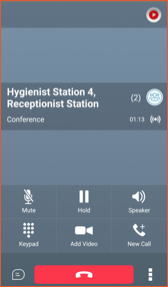 If you have an active call, touch the menu in the lower right and choose Conference. To add the new party, choose an existing contact, enter a phone number directly or choose from previous call history. If you choose a contact, you will be given the list of numbers from their profile that you can reach them at. Touch the number to use and once they answer, everyone is joined together in a conference. The other option is to touch the New Call button. To add the new party, choose an existing contact, enter a phone number directly or choose from previous call history. If you choose a contact, you will be given the list of numbers from their profile that you can reach them at. NOTE: While you are choosing the party to add, you are still connected to the calling party. They are not put on hold until you place a call to the new party. Once the other party answers, you can speak with them and the original party remains on hold. When you start a conference call this way, you will see both parties’ information on the screen. You can swap conversations between both parties by pressing the Swap key. This allows you to talk to either party while keeping the other party on hold. 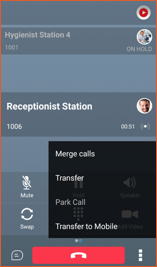 To combine everyone into a conference, touch the menu in the lower right corner and choose Merge Calls.